This simple salad uses some of our favorite spring ingredients including crunchy radishes, sweet snap peas, fresh mint and tart Meyer lemons. In a medium bowl, thinly slice the Meyer lemons, catching the juice and removing the seeds as you go. Discard the ends and set aside. Wash and tear the lettuce and mint, slice the radishes and snap peas, set aside. In a small bowl, whisk together all the dressing ingredients, plus the lemon juice that you gathered from the sliced lemons and whisk until well combined. 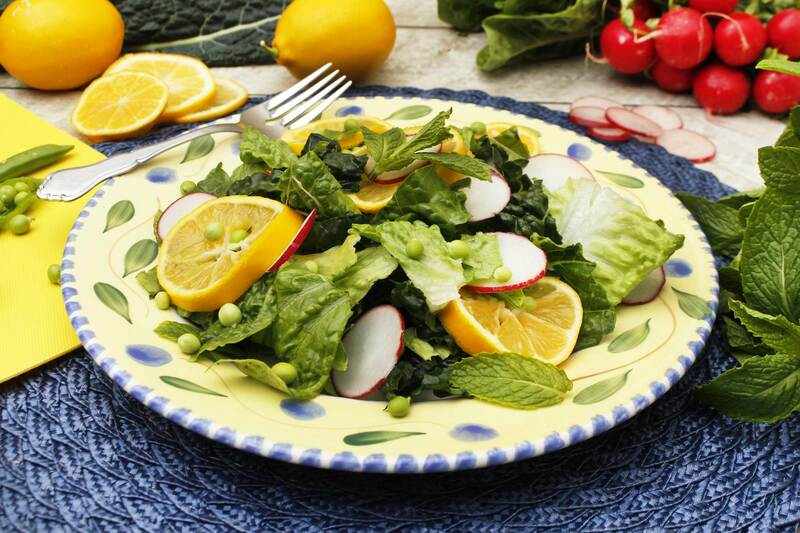 In a large bowl, toss the lettuce, snap peas and radishes with half the dressing, place a handful onto serving dishes, top with the lemon slices and fresh mint. Drizzle over a little dressing and serve.